In the end, we prevailed (after a sort). We get much of the credit for preventing planetary incineration that seemed frighteningly close at the time (Gorbachev deserves some too). Professional activists, Plowshares heroes, and a handful of stalwart others stayed in the antinuclear weapons movement trenches. Although nukes were not abolished with the end of the Cold War, most of the rest of us nonetheless moved on to fight other evils, and to work on one or more better world construction projects. Increased lucre for the nuclear weapons complex maintains Obama’s inconsistency on the Bomb. He wrote his senior thesis at Columbia on the arms race and the nuclear freeze campaign. Two months after his first inauguration, he uttered these words in Prague: "So today, I state clearly and with conviction America’s commitment to seek the peace and security of a world without nuclear weapons." The Pentagon’s 2010 Nuclear Posture Review promised to avoid "new military missions or . . . new military capabilities" for nuclear weapons (don’t laugh, you’d be surprised how imaginative those guys can be). 2011 was even better: Obama signed the New START Treaty. It limits the number of operationally deployed nuclear warheads to 1550, a 30% decrease from the previous START Treaty, signed in 2002. New START also lowered limits on the number of launch platforms – ICBMs, ballistic missile launching subs, and nuke-equipped bombers. At the same time, his State Department refuses – under first Hilary Clinton and now John Kerry – to present the Comprehensive Test Ban Treaty to the Senate for ratification out of timidity over expected resistance (never mind that the US has essentially figured out ways to circumvent the Treaty’s spirit if not letter; the CTB was once the ‘holy grail’ for arms control and disarmament advocates). That same State Department refrains – under both Hilary Clinton and John Kerry – from getting tough with Pakistan over its years-long obstruction of United Nations-sponsored negotiations over a global ban on the stuff needed to make bombs. (Pakistan is the country building them faster than any other; how about: "we’ll ground the killer drones in exchange for a fissile material cutoff?"). 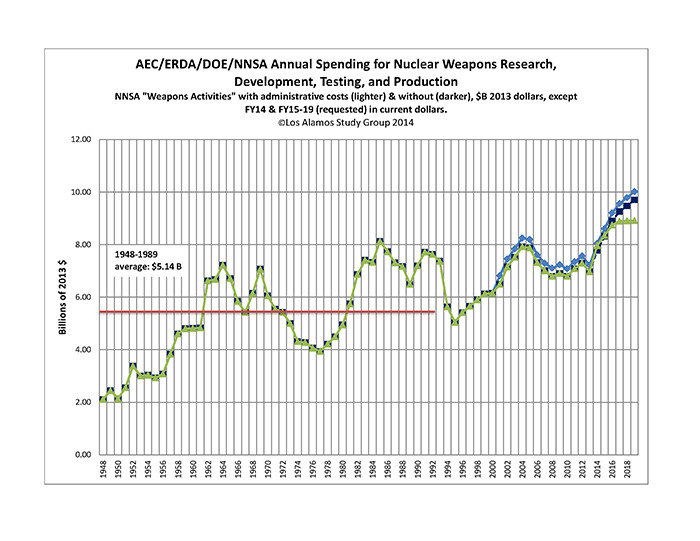 And Obama now wants to outspend Reagan on nuclear weapons maintenance, design and production. Steve Breyman was 2011-12 William C. Foster Visiting Scholar Fellow in the Euro-Atlantic Security Affairs Office of the Bureau of Arms Control, Verification and Compliance at the US Department of State where he worked fruitlessly on reforming nuclear weapons policy. He is author of Movement Genesis: Social Movement Theory and the West German Peace Movement and Why Movements Matter: The West German Peace Movement and US Arms Control Policy. Reach him at breyms@rpi.edu.